Rugged Ridge 10,500lb Synthetic. This heavy duty 10,500lb synthetic rope winch is the latest release from 4WD1. Futures include a durable 6.6hp series-wound motor, a 3-stage planetary gearbox with 218:1 ratio, 94 feet of Dyneema SK75 rope and all-weather cable remote. 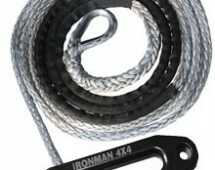 Synthetic Rope winches are often associated with compeition-event vehicles, and hard-core off-roaders. However, whether you’re young (or just young at heart) the properties of a Synthetic Rope winch (stronger, lighter, won’t kink, curl or splinter) make them easier to handle and work with. You’ll have more energy to focus on the recovery process. Ideal for family adventurers, outback tourers, agriculture, forestry and more. Features include a durable 6.6hp series-wound motors, a 3 stage planetary gearbox with 218:1 ratio, 94 feet of Dyneema SK75 with a breaking strain of 19,310lbs and pre-terminated hook, an in-the-drum automatic holding brake system, billet aluminum hawse and a 12′ all-weather cable remote. Total package weighs just 31kgs! 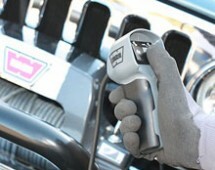 Great for reduced front-end load weight and vehicle drive dynamics. In short, the Rugged Ridge Synthetic Rope winch is both tough, reliable and powerful.